Your Ada Diamonds Concierge team is committed to delighting our clients with every purchase-and we want you to feel the same amount of excitement every time you wear your beautiful jewelry as the day you received it – and that includes maintaining its scintillating brilliance! Caring for your diamond jewelry is of great importance in order to make sure it sparkles and shines, as well as for making sure the settings and metal keep their good condition. When you purchase jewelry with Ada, our Concierge team will walk you through the process of care, and provide you with a kit that will assist you in taking care of your jewelry. This kit includes a complimentary travel pouch to protect your jewelry when it's not being worn, along with a non-toxic foam cleaner and gentle brush. Caring for your jewelry can be outlined in three easy sections: wearing and storage, regular maintenance, and professional checkups. Depending on the piece you own, and how often you wear it, cleaning your jewelry can either be weekly or occasionally. Beginning with wearing and storage: it is always our recommendation that your jewelry be stored in its original box, or in protected soft pouches, as this will prevent from jewelry being scratched from brushing up against neighboring pieces. When traveling, we recommend a soft-lined pouch, such as the one you receive with your order. When wearing your fine jewelry, do your best to protect it from the elements, and from any situations that might involve impact, chemicals, or abrasive surfaces. Household chores, makeup and bath routines, and outdoor activities can be especially risky for fine jewelry – so be aware of how your piece interacts with your surroundings, and the activities you perform while wearing it. Of course we all know that some interaction can’t always be helped, especially with pieces of daily-wear, so regular at-home cleaning can help in maintaining its shine! As for regular maintenance, you can easily care for your fine jewelry at home, cleaning on an as-needed basis depending on how often you wear it. Using your Ada Diamonds Cleaning Kit, simply brush your jewelry with the gentle soft-bristle brush and our cleaning solution, rinse it with lukewarm water, and dry using a soft cloth. Should you run out of our solution, we recommend creating a diluted blend of water and non-toxic soap (6:1). Although they are popular, we do not recommend using at-home ultrasonic devices, as the calibration in these machines can be too strong, and can thus loosen stone settings. 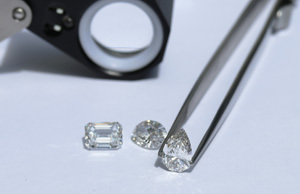 Ada Diamonds prides ourselves on our lifetime guarantee of our fine jewelry, so we are always happy to provide you with a professional cleaning if you send your pieces our way. This is a complimentary service for pieces dropped off in person in Sunnyvale or San Francisco, and available for a small fee for our remote clients. We recommend servicing your jewelry at least once a year, depending on how often you wear it. This cleaning can also be done through trusted local jewelers. A professional cleaning will not only enhance the sparkle and shine of your stones and metals, but it will also allow a chance to inspect the settings to make sure prongs are strong, and that no smaller stones are at a risk for loss. Pavé-set stones can be especially at risk for loosening through regular wear, so it is best to make sure the surrounding metal maintains its strength and good condition. Caring for your fine jewelry also means caring for the metal it is set in. Whether you have chosen white, rose, or yellow gold, or platinum, we want to make sure your metals glean and shine! Gentle cleaning using the same 6:1 water and non-toxic soap ratio as mentioned before is recommended on a regular basis, and professional polishing (which is a bit more thorough, and aimed at minimizing wear versus decreasing dirt) is recommended once or twice a year, depending on how often you wear the specific piece. Gold metals are softer than platinum - with the higher karat weights being more prone to scratching as there are less alloys in the formula - so over time it can be professionally re-plated to restore surface luster. Because platinum is a stronger metal, it does not require as regular of cleaning as gold, but it can develop a softness to its shine after continuous wear. Professional polishing carefully buffs the metal, clearing any cloudiness it might have developed after wear. With proper storage and diligent care, we believe you will be able to enjoy your jewelry in its brilliant original condition with ease! Owning a piece of Ada Diamonds jewelry is a privilege, and is something that should be a true enhancement to your life. Being able to wear your jewelry with pride is a large part of that experience, so keep your stones sparkling and brighten the world with beautiful Ada Diamonds! Are you ready to build something that will sparkle for a lifetime? Inquire with our friendly Diamond Concierge team, or browse our collection pieces for inspiration.